Bearings acts as fusing components in bridges and transfer loads from superstructures to substructures. During earthquakes, bridge bearings may be subjected to large axial compressive loads and lateral displacements, and consequently experience severe damages. 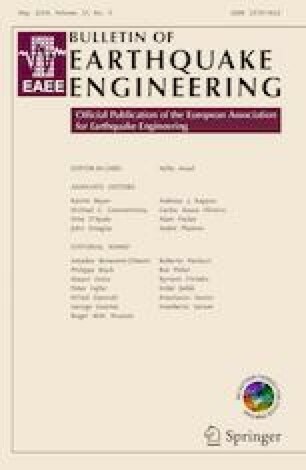 In this paper, an input energy-based (IEB) and a sliding displacement-based (SDB) damage index are proposed for quantifying seismic damage of the bridge bearings. The IEB damage index, previously proposed by authors, as the ratio of the dissipated energy to the earthquake input energy, and the SDB damage index is defined considering yielding displacement of the bearings corresponding to their sliding threshold. To evaluate the ability of the proposed damage indices in damage assessment of the bridge bearings, the force–displacement behavior of three commonly used bearings including elastomeric bearing, lead–rubber bearing, and flat sliding bearing are developed using rheological models. A set of the bearing specimens experimentally tested under cyclic/seismic loadings is adopted to calibrate the reliability of the damage indices. The results show that the IEB damage index provides a reasonably gradual progression of damage throughout the loading history and gives acceptable values for sliding and failure damage levels of the bearings more convincingly than the SDB damage model with respect to the experiment observations.